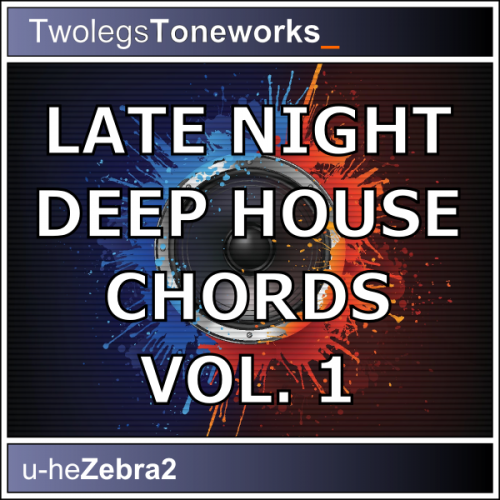 ‘Late Night Deep House Chords For Zebra’ is a collection of freshly programmed House chord stabs created for u-he’s Zebra 2 synth. The soundset is aimed at the deeper sides of House, but can be used in just about any House or Techno gerne that uses chord stabs. This pack contains a broad variety of different chord sounds, all suitable for the House and Techno genres. All the sounds are programmed carefully for playability and easy automation through the use of the modulation wheel on your MIDI controller keyboard. This chord-collection is guaranteed to fit perfectly into your next Deep Techno, Garage and/or Soulful House track. Sounds are supplied in u-he Zebra native preset format “h2p”.